Perfect time (sunset cruise at 18:30), perfect length as ore-dinner activity to kick back and relax (45 minutes) and very good service with attentive staff. Loved the bright red sails! It felt like getting on a pirate ship but with the twist of a complimentary cocktail instead of a shot of rum! Fantastic tour. Tom is great. Extremely knowledgeable, accommodating and friendly. Doing the sites that Tom shared with us would not have been the same without his guidance. Very highly recommenced. 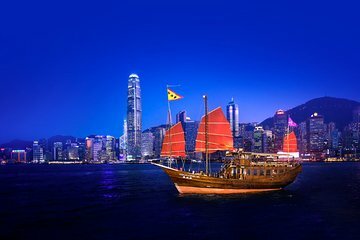 Great night time views of Hong Kong Victoria Harbor. Everything went very well. The service was excellent, as well as the sightseeing! It was a wonderful experience, indeed. We ended up being accommodated on the light show ride which was disappointing since we paid extra HK$150 each for the Aqua Luna with light show.